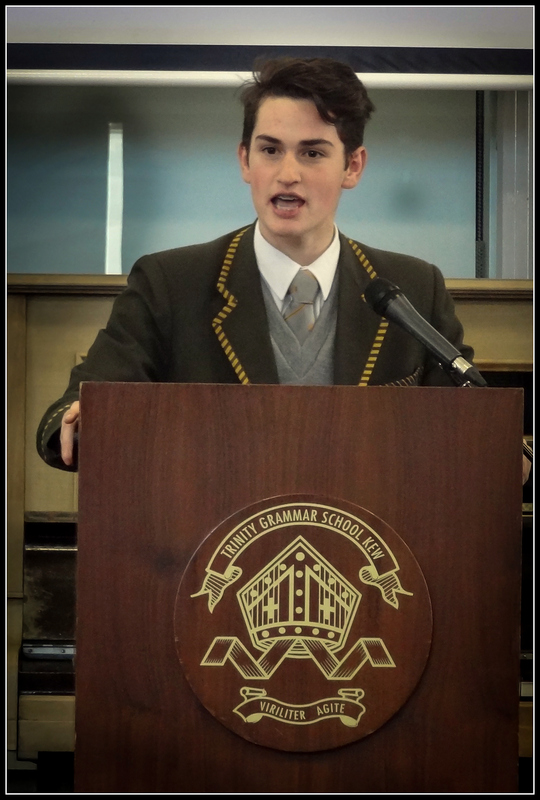 The debating program at Trinity Grammar School offers students a wide range of opportunities to develop their oratory and research skills, allowing them to confidently present a well-structured argument in a public setting. The skills attained are boundless and can only add to the character of our boys who present themselves in an outstanding manner. The Debating Association of Victoria inter-school debating competition, is held in two separate categories: One for the senior boys from years 9-12 and then, a junior secondary program for boys in years 7 and 8. Boys are also encouraged to engage in the House Debating Program which is held every Wednesday at lunchtime throughout term 3. Exhibition debates are presented during every term, where individual students are given the opportunity to showcase their skills in front of the wider school community. These are fun and lightly humoured debates involving staff, students from Ruyton and students from MLC. Public Speaking at Trinity Grammar School allows students to practice and sharpen their oratory skills in a competitive environment, teaching them to formalise and perfect their abilities in this area. There are numerous competitions, both external and internal, some of which have monetary prizes. In order to support the development of these skills, public speaking training sessions are held for students from years 7 – 12 during terms 1, 2 and 3 on Friday mornings.